– Rip Rogers joins the show discuss ICW, The Poffos and his memory of the night of the Sugar Hold Challenge! Rip, who was a partner in ICW, shares his knowledge about how ICW was formed and what it was like to be involved in an outlaw promotion. 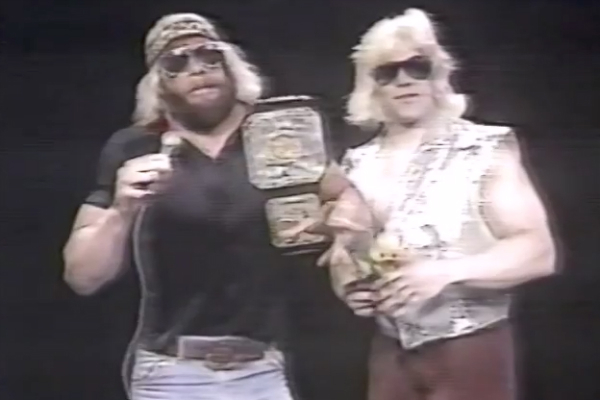 Rip also gives tells us what he saw when Randy Savage & Bill Dundee had their parking lot fight which ended with Dundee having a broken jaw, as well as the infamous fight Randy Savage got into at the Waffle House! A fun and informative talk! – Longtime WWWF TV “timekeeper at the bell” Mike Mittman talks about his many years sitting ringside at TV tapings in Allentown & Hamburg. Mike shares him memories of popular ring announcer Joe McHugh, who he was close with, as well as Dr. George Zahorian, who Mike introduced into the world of wrestling. Mike talks about Vince McMahon Sr. & Jr., Gorilla Monsoon, Phil Zacko & many more. Mike also tells us about the night he refereed a Saturday Night’s Mani Event and got clobbered by Andre The Giant! – TGBL & TR Shock discuss everything from Tom’s recent attempt to meet Cyndi Lauper to Jim Ross. Plus Hot Dog & Lasto, TRnac, Stuttering Tommy Rich, The Handsome Boogie Man, Jim Cornette’s Answering Machine, the Tom Robinson Impression Challenge & more! See Judd Apatow’s documentary film “May It Last: A Portrait Of The Avett Brothers” in theaters for ONE NIGHT ONLY on September 12th!